The central midfielder of Casa Sports (Senegal), Stéphane Diarra Badji, mostly referred to as Stéphane Badji, could very well become the next star midfielder from Senegal – a country that has produced several fine players in this role for the last couple of years. Joseph Koto, the coach of Senegal B has praised Badji several times and described him as a player representing the future of Senegalese football. His coach at Casa Sports, Athanase Tendeng, has also been generous with words of praise and described him as a player with obvious qualities. Stéphane Badji played for Dakar-based club ASC Xam-Xam in 2008, a team that experienced relegation after winning only nine points in 18 matches. Badji was signed by top club Casa Sports in January 2009, together with team-mate Younouss Badji. As far as I know, Badji made a positive impression during the 2009-season, without excelling. However, his 2010-season was impressive, becoming a regular for his team and scoring three league goals. He is often used at the playmaker of the team but is also able to take defensive responsibilities. The exact date of birth of Badji is still unknown to me but he was apparently 20 years old in September 2010, which makes it likely that he is born in 1990. In July 2010, Badji was invited for trials at Stade Rennes from Ligue 1 in France, where he was referred to as a defender in most reports. 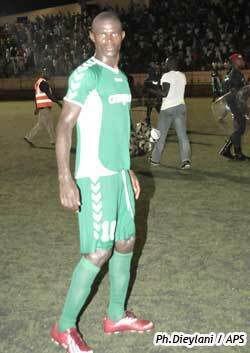 He was back in Senegal in September 2010, playing for Casa Sports in the Final of the ”Coupe de la Ligue” on 19.09.2010. The match went into extra time and Stéphane Badji became matchwinner after being set up by the talented Emile Paul Tendeng that I wrote about on 10.10.2010. Joseph Koto was present at the Stadium and stated that Badji would be included in the next squad of Senegal B, a team preparing for the so-called UMEOA-tournament in Niger, a tournament for B-teams of several French-speaking West-African countries. He was also mentioned as a strong candidate for a place in the squad for the so-called CHAN-tournament that will take place in early 2011. As far as I know, Badji has never before been a member of any Senegalese national football team. Unfortunately, Badji is currently injured and according to fresh reports it looks rather unlikely that he will participate in the UMEOA-tournament that will start later this month. The picture is taken from Agence de Presse Sénégalaise.